Lady Barron Holiday Home accommodation is your home away from home on Flinders Island, only a moment from the water's edge with superb views of Franklin Sound and Cape Barron Island. You will have all the space and convenience of a three bedroom house that comfortably sleeps six or more people. 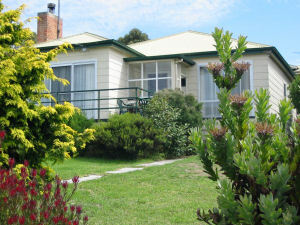 You will enjoy a truly tranquil and stress-free environment at Lady Barron Holiday Home - Flinders Island accommodation, just perfect for a couple, a family or a group of friends. Autumn is the season most Islanders say Flinders Island is at it's best. Usually very calm weather and is still quite warm during the day with very flat seas and lovely reflections. Lady Barron Holiday Home is your home away from home, rated at 3.5 stars, only a moment from the waters edge with superb views of Franklin Sound. 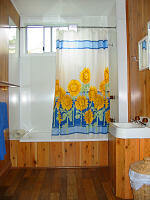 You will have all the space and convenience of a three bedroom house that comfortably sleeps 6 people. There is one double bedroom and two twin bedrooms. 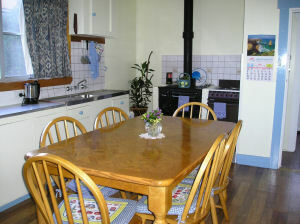 From this comfortable house you can enjoy within walking distance all that Lady Barron has to offer from fishing at the local wharf, dining at the Furneaux Tavern, magnificant swimming beaches, excellent views from Vinegar Hill and is only walking distance from local supermarket/newsagents/post office. Or you may wish to hire a car to explore the rest of the Island. Lady Barron Holiday Home is fully equipped for your convenience with all linen, sheets, towels etc, electric blankets, bed lights, T.V, C.D player, D.V.D player, telephone, wood heater, fan heaters, reverse cycle airconditioner, electric oven, microwave, B.B.Q with eski and thermos. We also offer free garden fresh vegetables in season. Price quoted is for one to two people only. Price quoted is for four people only. Price quoted is for one to six people. Price quoted is for three people only. Price quoted is for five people only.